In most planned instances, your company was built on a sound business model. And then you’ve hopefully applied a strong strategy to execute success. Too often these terms are used interchangeably. Knowing the difference and applying both appropriately is important to your business growth. The Harvard Business Review has a series of explainer videos and I found this one on Business Models and Strategy to be a wonderful quick reference guide. Models are often projections before the work is done. A model is the story that tells how you’re going to make money, who your customers are and the formulas with changeable variables that lead to your success. Don’t confuse that with a strategy that defines your differentiation internally and externally simply to guide your winning principals. Wal-Mart is a great and intriguing example used by HBR in the video as well as used in my book Ruthless Focus to show the difference between a business model and expertly applied use of a focused core strategy. 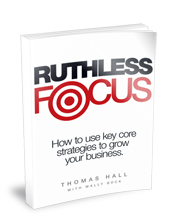 Pick up a copy of Ruthless Focus today to read details and read more from The Harvard Business Review.